While gloves are a vital piece of boxing gear you can’t go without, the shoes you wear can be just as important. Whether you’ve been taking out your opponents for years or are about to step into a boxing ring for the first time, the right pair of boxing shoes can make a huge difference. Boxing isn’t just about the fists, but also how you move around the ring. You must move defensively as you dodge your opponent’s swings while also taking the offense as you move closer to make contact. A bad pair of shoes will slow you down and affect your agility. Regular old sneakers aren’t made for the ring. Boxing shoes are carefully designed with the sport in mind. They are built to withstand constant movement and contain a number of features that will improve agility. They also provide much more support in crucial parts of your foot, ensuring that you stay safe. 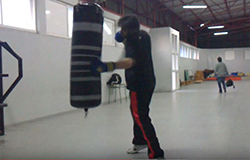 Here are some great options made for a round in the boxing ring. These high tops from Title offer loads of support, comfort, and flair. They are 12 inches high, covering your entire ankle and part of your shin. This height will keep your ankles secure and stable, improving your speed. The sole is made from nylon and polyurethane, making them comfortable to wear during a long practice or intense match. The lace extends up the entire shoe, allowing you to get a snug and cozy fit. If you like to flaunt your style in the ring, these shoes have you covered. They come in a number of colors and have attractive stitching. From the trusted sports brand Adidas comes the Bog Hog 2 boots. These provide a healthy medium between high and low tops, giving you the best of both worlds. You’ll have the stability of high tops without the added weight. The mesh will keep you cool through even the fiercest match. Woven textile adds support while the suede keeps everything light. Stay on your feet with the rubber soles that add great traction. With a traditional design, you can’t go wrong with these shoes. 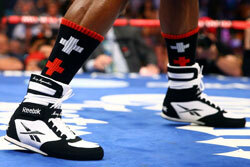 Become a demon in the ring with the Diablo boxing shoes from Ringside. These shoes have a low top design, allowing you to move your ankles more freely. You’ll have better control and flexibility as you dance around the ring. They have mesh panels throughout, improving ventilation inside. A patent leather vinyl finish outer material is rugged and attractive. The shining material is eye-popping, especially when it is in one of the many bright colors available. With a low price tag, these shoes are great for any boxer. 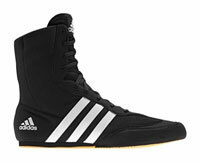 Another option from Ringside, these shoes have a moderate height. They provide both flexibility and stability without weighing you down during a match. The rubber sole has grooves, which improves traction and gives you adequate grip to make intense moves. The sole is also comfortable enough for prolonged use. The tips of the boots are reinforced. This makes pivoting and complex moves easier to pull off. Suede and breathable mesh make up the outside of the shoes, adding to their comfort, durability, and lightness. 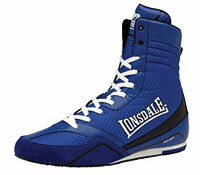 The Quick boxing boots from Lonsdale are made for boxers that want speed and agility as they navigate the ring. The low top gives you more flexibility. They are made from lightweight ripstop material and suede. This combination of materials make them very tough, yet light. Inside, an EVA midsole provides arch support and cushion. The sole is made from rubber and uses a unique waffle design to grip the ring canvas. An attractive design and superb build make it great for both novice and experienced boxers. If you’re in the market for some new shoes, you’ll find a wide variety of different brands and styles available. If you ask seasoned boxers which shoe to go with, they’ll more often than not tell you all different options. Truth is, the right shoe for you will depend entirely on your boxing style. That being said, there are a number of common things you can look for. Knowing what makes a boxing shoe different from a normal shoe and what to look for will allow you to narrow down your choices so that you can find the perfect option. What Makes A Boxing Shoe? Boxing shoes have a very distinct style and design. The main goal of a pair of boxing shoes is to provide a solid foundation while you make your moves. They aren’t like normal sneakers. Instead, they are made to provide you with the perfect amount of traction and support. They look very similar to wrestling shoes. However, they don’t provide as much traction. This is important, as too much grip can slow you down. This is most noticed by seasoned boxers, but it can also affect novice sportsmen over time. Boxing shoes also tend to be padded, yet light. The slight padding keeps your feet comfortable without weighing you down in the ring. Mesh materials are also commonly used to improve air circulation and keep your feet dry. 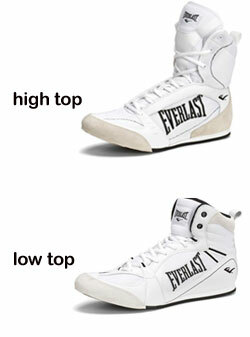 Boxing shoes can be either high or low tops. The right pair for you will depend on the type of boxing you do and your particular style in the ring. It all comes down to ankle support. Low top shoes still feature some ankle support. 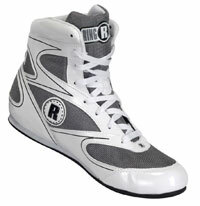 In fact, a low top boxing shoe looks like a high-top sneaker, as the shoe still extends up the leg. However, it doesn’t constrict ankle movement. This makes the shoes perfect for speed boxing. You’ll be able to move your foot freely, allowing you to bounce around the ring much faster. 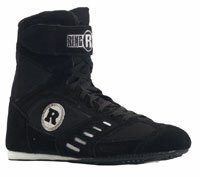 High top boxing shoes extend far beyond the ankle and slightly up the shins. They provide much more protection to the ankles and can help your movement with pivots. The slight constraint on the leg will keep you taught, allowing you to turn and pivot with much better control. The material of the shoes can have a huge effect on overall comfort. Leather and suede are great materials to look for. They are used by many manufacturers because of the flexibility, strength, and comfort they provide. Other materials to look out for include mesh and rubber. Mesh panels will improve ventilation in your foot to keep you comfortable. Rubber outsoles will ensure better traction. All in all, you should look for materials that are comfortable, yet light. The lighter the shoe, the less it will hinder your performance. 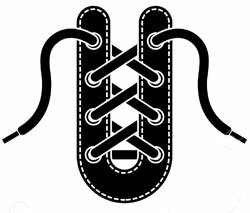 Boxing shoes often come with laces or zippers that run up the entire length of the shoe. When choosing a shoe, find a pair with a closure that is easy and comfortable. More often than not, laces are the better choice. Not only do they provide a better fit, but they are more comfortable and less blister-prone than tough zippers. The fit of a pair of shoes is the most important thing to look out for. Shoes should improve your skills, not hinder it. Because they are made to be light, you may find that getting the perfect fit is easier said than done. 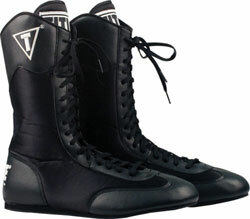 Boxing shoes are more narrow than ordinary sneakers and have a thinner sole. To compensate for that, midsole cushioning is often included. This will improve comfort while protecting your feet from injury. That being said, the midsoles can dramatically affect the fit of the shoes. Luckily, shoemakers often put straps on the midsoles to create a more custom fit. Shoes should fit you as well as your boxing gloves. An ill-fitting pair of shoes will prove to be a disaster in the ring. They should be snug, but not too tight. In fact, you shouldn’t even notice that you’re wearing shoes. The right pair of shoes will be a part of your feet and help you win the match.